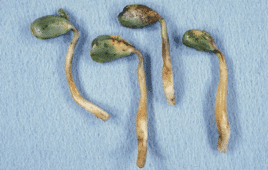 Pythium species are oomycetes (fungi-like organisms) that can infect soybean seed within hours after planting causing seed rot and is also associated with death of a developing seedling (called ‘damping-off’) and death of a seedling prior to emergence (called ‘pre-emergence damping-off’) – all resulting in the absence of plants in the row. 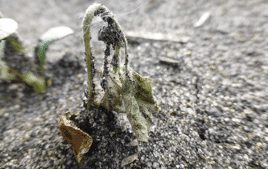 Infection is favored by wet conditions after planting and is typically a problem in cool soils in north central U.S. and Canada. Symptoms include rotten, mushy seeds and/or seedlings with poorly developed roots. Water-soaked lesions may be present on the hypocotyl or cotyledons.